The SynTower® is the latest development of the PolyGen instrument line. Its modular design is based on the SynTowers® DNA Synthesis Workstation. 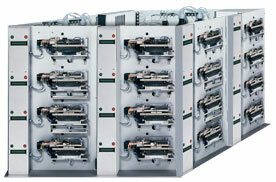 Up to 32 modules with 12 columns each can be operated independently. Thus, up to 384 oligonucleotides can be synthesized in parallel. Convenient placement in your lab The required space is minimal: 120 x 120 x 100 cm (length x depth x height).